LAUREL, Md. (JHUAPL PR) — NASA’s New Horizons spacecraft flew past Ultima Thule in the early hours of New Year’s Day, ushering in the era of exploration from the enigmatic Kuiper Belt, a region of primordial objects that holds keys to understanding the origins of the solar system. Signals confirming the spacecraft is healthy and had filled its digital recorders with science data on Ultima Thule reached the mission operations center at the Johns Hopkins Applied Physics Laboratory (APL) today at 10:29 a.m. EST, almost exactly 10 hours after New Horizons’ closest approach to the object. 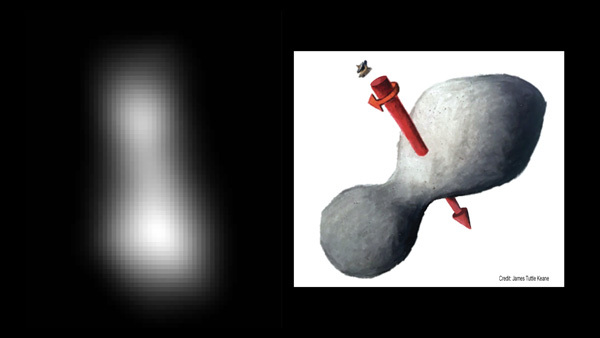 Images taken during the spacecraft’s approach — which brought New Horizons to within just 2,200 miles (3,500 kilometers) of Ultima at 12:33 a.m. EST — revealed that the Kuiper Belt object may have a shape similar to a bowling pin, spinning end over end, with dimensions of approximately 20 by 10 miles (32 by 16 kilometers). Another possibility is Ultima could be two objects orbiting each other. Flyby data have already solved one of Ultima’s mysteries, showing that the Kuiper Belt object is spinning like a propeller with the axis pointing approximately toward New Horizons. This explains why, in earlier images taken before Ultima was resolved, its brightness didn’t appear to vary as it rotated. The team has still not determined the rotation period. As the science data began its initial return to Earth, mission team members and leadership reveled in the excitement of the first exploration of this distant region of space. The New Horizons spacecraft will continue downloading images and other data in the days and months ahead, completing the return of all science data over the next 20 months. When New Horizons launched in January 2006, George W. Bush was in the White House, Twitter had just been launched and Time Magazine’s Person of the Year was “you — all the worldwide web users.” Nine years into its journey, the spacecraft began its exploration of the Kuiper Belt with a flyby of Pluto and its moons. Almost 13 years after the launch, the spacecraft will continue its exploration of the Kuiper Belt until at least 2021. Team members plan to propose more Kuiper Belt exploration. The Johns Hopkins Applied Physics Laboratory in Laurel, Maryland, designed, built and operates the New Horizons spacecraft, and manages the mission for NASA’s Science Mission Directorate. The Southwest Research Institute, based in San Antonio, leads the science team, payload operations and encounter science planning. New Horizons is part of the New Frontiers Program managed by NASA’s Marshall Space Flight Center in Huntsville, Alabama. Follow the New Horizons mission on Twitter and use the hashtags #UltimaThule, #UltimaFlyby and #askNewHorizons to join the conversation. Live updates and links to mission information are also available on http://pluto.jhuapl.edu and www.nasa.gov.